Below is the appalling new post by the author of the Catholic Voices blog. Who could have penned such nonsensical nastiness? My emphases, bold, purple. 'According to John Smeaton of the lobby SPUC, Catholic Voices seeks "to redefine the common perception of what constitutes mainstream Catholicism in England" (This criticism, he actually levelled at Dr Ivereigh himself). Behind this conspiracy, he asserts, lies The Tablet. And his reason for believing that CV coordinators Ivereigh and Valero share this aim? Why, "Dr Ivereigh's loyalty to The Tablet" -- on the basis that he refused to accept a blogger's invitation to describe the weekly as a "vehicle for dissent". 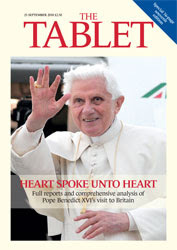 Yesterday, I managed to obtain a 'complimentary special supplement' of the Papal Visit to the UK produced by The Tablet, written prior to His Holiness's arrival. Oh dear! Sales still going through the floor then after all these years! Looks like they can't give it away! Inside is a collection of writing, nova et vetera, by such Catholic heavyweights as Edward Stourton of the BBC, John L. 'Flippin' Taliban Catholics!' Allen Jr, Mgr Roderick Strange, Michael Glover and John Cornwell. Gosh, what a dazzling array of talent! This was a US study into the knowledge of religion comparing that of atheists, agnostics and religious believers. No 'only in America' comments, please, because, let's face it, it is highly likely that there is a similar ignorance of Church Teaching in the UK as well. The Holy Father very much desires an 'educated laity'. This study gives us more evidence as to why. "Is He a Fanta Drinker?" I think its a nice, subtle way of asking whether Priests, Bishops, Cardinals, Religious Communities and Catholics in public life are loyal to the Pope and faithful to the Magisterium. Just ask, "And what about ____________? Is/Are he/she/they (a) Fanta drinker(s)?" Of course, the term, "Catholic" should really suffice, but nowadays there are so many Catholics in positions of influence whose words and beliefs do not reflect the Church's Teaching that it is really worth creating a euphemism. Pictured left is The Garrick Club. My friend George used to work there as a barman when he lived in London. "It would be better that 10 unobjectionable men should be excluded," decided the committee of the 178-year-old Garrick Club when it drew up its original criteria for membership, "than one terrible bore should be admitted..."
UK's homosexual population size revealed: Just 1.5% of Britons say they are gay, lesbian or bisexual.I had thought it was 1 in 10...Oh well, perhaps that was just propaganda after all. 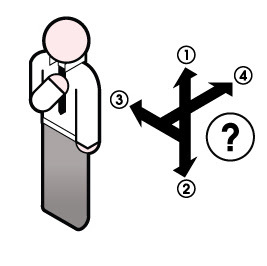 1.5 % of the UK...According to the Mail, that's about 1 in 100 people identify as L, G, or B . How can it be that just 1.5 % of the population are running the BBC and other mainstream media outlets? Credit where its due! You can say what you like, but that's an incredible work rate and tireless effort on behalf of the cause! If only we Catholics were so devoted! There were two in contention but while this guy may have just got elected as Labour leader, I don't think he's got what it takes to get Labour elected again. Good job too. Voted very strongly for a wholly elected House of Lords. Voted very strongly for introducing a smoking ban (Nazi!). Voted very strongly against an investigation into the Iraq war (Oh dear, that'll be popular!). Many of us so-called Taliban Catholics have been severely disappointed in your over-willingness to negotiate with the state about how our Catholic adoption agencies should be allowed to operate, and how our schools should explain the facts of life to our children. Like many millions of people in this country and around the world we are very proud and happy at how the British people have taken The Pilgrim from Rome to their hearts. We are prepared to, metaphorically-speaking, bury the hatchet and truly welcome the words of Archbishop Vincent Nichols this weekend following our Holy Father's visit. 'Catholics are to be encouraged to make their faith more visible by saying "God bless you" and making the Sign of the Cross more often. The advice, in a letter from the Archbishop of Westminster, comes a week after the Pope's state visit to Britain. The Most Reverend Vincent Nichols, head of the Catholic Church in England and Wales, said the historic four-day trip by Benedict XVI brought "such joy" and gave "a great boost to so many", providing believers with "new heart" for their mission. Equal Employment Rights for People Who Dress Terribly! I sympathise, love, I sympathise. The same thing happened to me today. ...is that the Poles recognise abortion for what it is. As 40 Days for Life begins in earnest, it is worth highlighting the extent to which the UK has fallen for the lies that emanate from the heart of the abortion industry. If only people could see the money that is made from the industry and those who profit from the human catastrophe of abortion and if only people could know how terrible the reality of abortion is. ...or just two-faced Tablet? Let's hope they keep it up. Check out Fr Ray Blake's piece on this week's edition. The magazine has so much potential! More of this and I might even consider buying it myself one day...The magazine, that is...not the Trust. 'The non-profit organisation set up by the U2 frontman received almost £9.6million in donations in 2008 but handed out only £118,000 to good causes (1.2 per cent). Bono has raised both his huge international profile and his own incredible wealth through his anti-poverty campaigning. A few years back he launched a campaign saying, "Every time I click my fingers another child dies of hunger." "Brothers! Onward to Bognor Regis!" This was the resounding cry of St Augustine of Canterbury to his Benedictine monks, having received yet another letter, egging him on, from Pope St Gregory I the Great to evangelise the English. "There's a lovely little town on the coast called Bognor Regis, not to be confused with Lyme Regis or Cyril Regis," wrote St Gregory I the Great, "go there and preach the Gospel, but, avoid Butlins at all costs for this is arid ground!" It is only fit, then, that Our Lady of Sorrows Catholic Church Parish Centre will be hosting a Gregorian Chant Workshop on October 23rd 2010, between 11am - 4.30pm. The workshop will be followed by Mass in the Ordinary Latin Rite. The Workshop will be led by Nick Gale, Director of Music at St George's Cathedral, Southwark. The cost is £10 a head and those interested are asked to bring a packed lunch, though drinks will be provided (Lambrini, anyone?). Thanks be to God! Two very wonderful Catholics (Thanks Austen! Thanks Jack!...Not really...) came to my aid and my car has been released from the City Car Pound. I may have a job delivering posters (yes, a career in walking! Who'd have thought it? Me - a Promotional Street Pedestrianiser!) around town centres in the South East, which could yet get my sorry behind out of the terrifying pit of debt. Still, I wouldn't mind a job at NatWest, then they could pay for their overdraft charges! Usurers! You give to the poor and then demand it back at interest and then grind them down into the dust! Ah well, it is only my just desserts. I used to work in the New Business Credit Card Department of Lloyds TSB. 'It’s only been a few days since Pope Benedict left our shores after what seems to have been a genuinely successful visit. Of course, many Catholics were ecstatic about every second in which the red shoes were planted on British soil; that’s not so surprising: there were enough extraordinary, historic moments in his trip to encourage such a response. But what was more unexpected for me was a couple of my sober and cynical non-Catholic friends admitting to being surprised at how much they just … liked the Pope. If he is a rottweiler, then he’s one who seems to encourage a tickle on the tummy rather than a bite-proof arm glove. 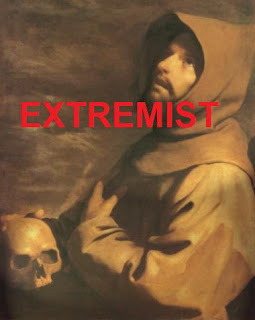 St Francis of Assisi: Bi-polar, poverty-embracing, self-immolating, death-fixated, full-on Catholic nutjob. St Dominic: Austere, autistic, pyromaniac. Bookish, scholarly radical. Unyielding on doctrinal issues. St Thomas More: Dangerous maverick and stubbornly loyal Papist. Why is it always the quiet ones? Known to rant about Conscience. Obsessive. Suffers cold sweats when asked to sign oaths to the Crown. St Joan of Arc: Schizophrenic militant Catholic vixen with sword. Trained by Catholics in a stronghold in France. Known to criticise notable figures in the hierarchy. Flammable, potentially incendiary insurgent. Blessed John Henry Newman: Extreme, controversial, polemical firebrand. Convert. Beware, for converts are nearly always Taliban Catholics who take aim at their former religion, very often denouncing it. The Sensible Bond has an interesting piece on Mr Ivereigh's quote which makes for interesting reading. Joking aside, I know I've kind of already given it away but, who, do you think, said this? "We didn’t get an application from a Lefebvrite. We did get a few from what you would call the “Taliban Catholics,” who of course have become very vociferous on the blogosphere in the last few years. They’re very critical of the bishops for compromising too much with modernity and not promoting Catholic truth as they see it. We also had applications from people in favor of the ordination of women, and who in general believe that the reforms of Vatican II have been insufficiently implemented, and who are angry at the bishops for the opposite reasons." 'Catholic Voices': An Opportunity Missed? I just worked out how to edit videos. The one thing that struck me about 'Catholic Voices', though I guess it continues now that the Holy Father has returned to the Vatican, was the extent to which candidates selected by Austen 'Ivory' and Jack 'Veneero' were all from a similar social background/social class, whatever you wish to call it. Quite possibly the bargain of the century. Does this mean the Holy Father could come back again? The BBC Want to Protect Children, Right? Er...read this and make up your own mind. We've received so much impartial criticism from the BBC over child protection over the years. I find one of the passages in the speech delivered by Pope Benedict XVI to the Bishops of England and Wales absolutely fascinating. There is so much we can say when reflecting on the wonderful success of the Papal Visit to the UK and I would struggle to put it all into words, but the aspect of the visit that struck me the most was the wonderful personality of Pope Benedict XVI. Arriving in a country in which anti-Catholicism and resentment towards the Church is rife, his manner, his graciousness and humility was strikingly disarming. He fulfils his Office with a profound simplicity of heart and purity of spirit. What became obvious was that, far from being a Pontiff who is uneasy in his role, or feels any need to cover his personality, holiness emanates from him. His spirit seems to be liberated, grounded in God, firmly rooted in prayer. Despite the public's negative perception of him, he seemed very relaxed and accepting of all things, managing to convince even some sceptics of his honesty. He is genuine and that will have broken down some high barriers. Shall We Watch it Again? The Pope is Not Dawkins Greatest Enemy...It is Us! The Holy Father has beatified Cardinal John Henry Newman to the immense joy of the Faithful in the United Kingdom. 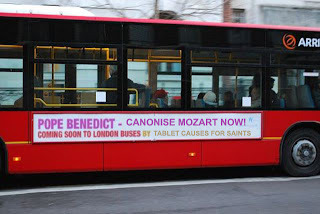 Pope Benedict XVI has graced us with his presence to the boundless joy of the Faithful in the United Kingdom. Dawkins and his followers, who are beginning to sound more and more shrill, bitter and rabid, are incensed by the fact that the Government invited him and they howl with derision at him and his message. Yet, it is our joy, the visible joy of believers that he will have despised the most, our devotion, that will have appalled him, our delight, which will have caused him great dismay! Protestant Truth Society to Protest Pope Visit? Who hasn't left their work in the pub? "Psst...Looking for a Gay Night? Try..."
"Pope Benedict! Ordain Cats Now!" "There is No Love without Sacrifice..."